Shortly after the home was finished, we began holding open houses to promote the completion of the first LEED certified home in Wichita and “green” building. During one open house, the local Fox TV station made an impromptu appearance to prepare a segment for their 9 o’clock news program. They were most intrigued by and show-cased the shoe-storage area because it is not immediately obvious how such a space would contribute to sustainability. But in fact, in the LEED rating system, this home did earn one (1) point for having a built-in shoe removal and storage space. Here’s the reasoning: Since Americans spend an average of 90% of their time indoors, LEED rewards homes that address issues related to “Indoor Environmental Quality”. According to the United States Green Building Council (USGBC), a majority of the dirt in homes is tracked in by the occupants on their shoes. This debris can contain lead, asbestos, pesticides and other hazardous material. 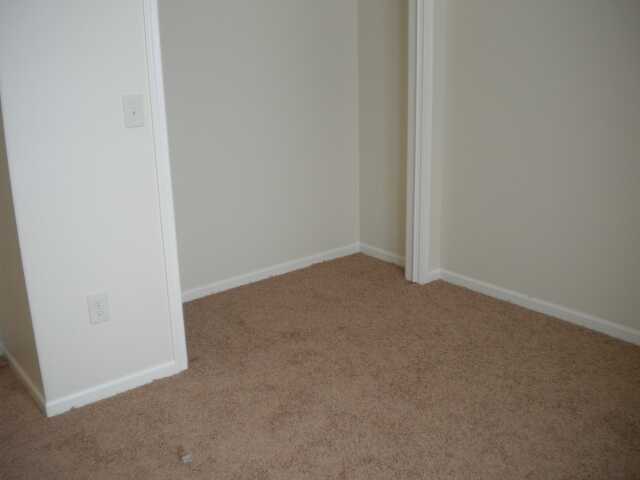 Shoes will also track in moisture that could lead to mold growth on the carpet. A built-in bench and shoe storage area, right at the main entry into the home, will encourage the occupants to remove their shoes. Less dirt and contaminants equal better indoor air quality, less energy to run the vacuum and fewer chemicals to clean the floor. We asked the homeowner if he was using the area. He replied that he was and that “it’s a very nice thing to be able to come in, sit right down and take your shoes off”. While we have no quantifiable measurements on the indoor air quality, nor on the vacuum usage, we can point to a homeowner who likes the convenience and is happy with this feature. 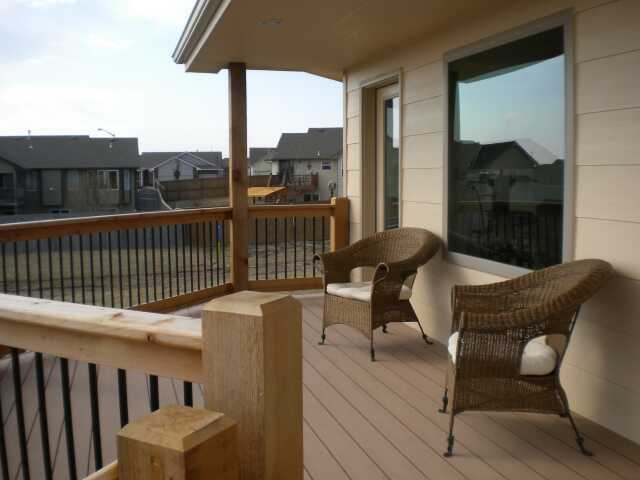 Tags:Bauer & Son Construction, green home, LEED for Homes, LEED Home Wichita, Why Green Homes? The only LEED certified home in Wichita. “What makes this home special?’ is the title of a feature article, written by Ron Sylvester, that appeared in the Wichita Eagle newspaper on November 15, 2011. The answer is, it’s the only one LEED certified in Wichita. Read Ron’s article and watch his video at www.kansas.com. This is the first of several blogs we’ll be doing to check in on the ‘green’ home – to see what features have worked well, and maybe a few that could have been re-thought. For this first blog, we went back and looked at how the bamboo floor was holding up. Bamboo is one of the darlings of the sustainable construction world. It is very much like wood but actually it is a grass; a very fast growing grass. It is this rapid growth that defines it as sustainable. It can be harvested in 5-7 years; versus 60-70 years for most hardwoods. It is moisture resistant and insect resistant. In general, it is harder than oak, although it is available in a wide range of hardness’s. 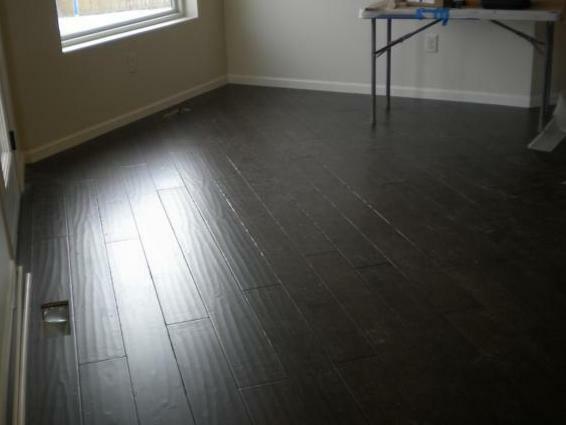 As for installation, it can be nailed, glued, or floated just like a conventional wood floor. 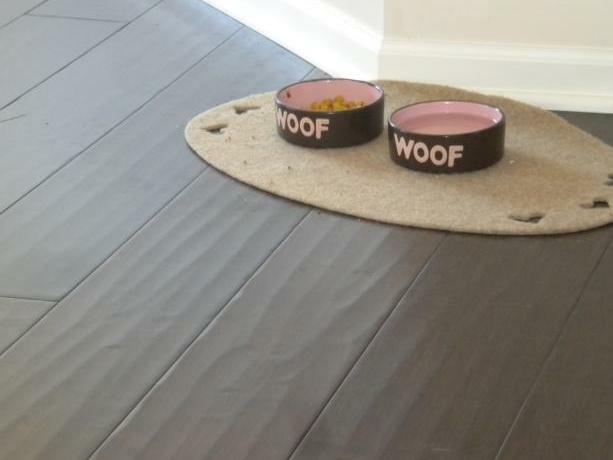 During the design phase of the home, we had planned for cork flooring, another sustainable option. However, the homeowner decided to use Bamboo simply for it’s aesthetics. Premium Green Bamboo, Hand Scraped, Vintage Collection, Jacobean flooring was chosen and it looked fabulous when it was first installed. It appears that not all bamboo flooring is equal. A Google search will reveal a wide range of experiences with bamboo flooring – from very satisfied to very unsatisfied. The 2 major complaints seem to be softness (showing scratches) and color fading. Our LEED home, however, has had neither of these issues. As you can see from the photos, after 18 months of use, the floor still looks fantastic. The owner pointed out one dent where he had dropped an electric drill. Otherwise it looks as good as the day it was installed. It has even held up to high heels and dog traffic. 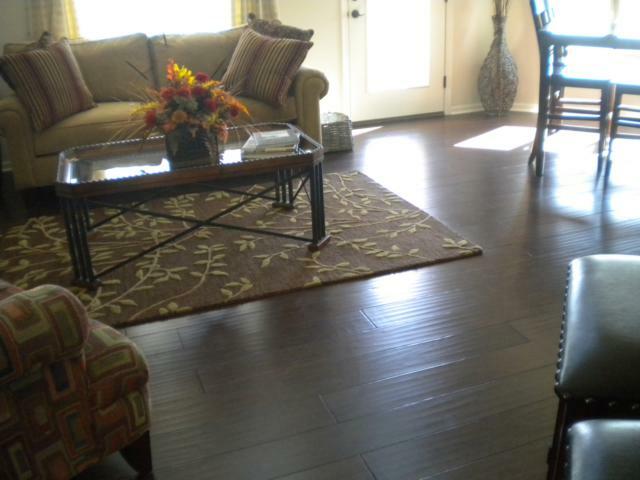 So far, for this home and this home-owner, bamboo flooring has proved to be a great sustainable choice. Soon after the third-party performance testing was performed, all the required forms were submitted to the various agencies to review and approve our applications for certifications. Sponsored by the US Department of Energy, Builder’s Challenge recognizes exceptional attention to quality and energy performance. The program uses the EnergySmart Home scale to rate efficiency. To meet the challenge, a home must achieve a rating of 70 or lower, representing an improvement of 30% over a typical home. This home met the challenge on March 1st, 2010 with a rating of 55. The NAHB Green Building Program was initiated in 2005 by the National Association of Home Builders. The NAHB Green Building program is similar to LEED, but only applicable to residential construction. Green Building Program houses are awarded points within specific categories and can receive a rating of Bronze, Silver, Gold or Emerald. On March 24, 2010 this home was awarded a Gold rating from NAHB. The LEED for Homes® rating system is the nationally accepted benchmark for the design, construction and operation of high performance green buildings. 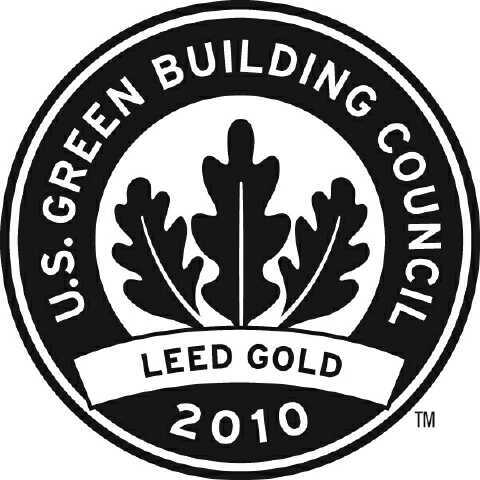 LEED projects are awarded points within specific categories and can receive a rating of Certified, Silver, Gold or Platinum. 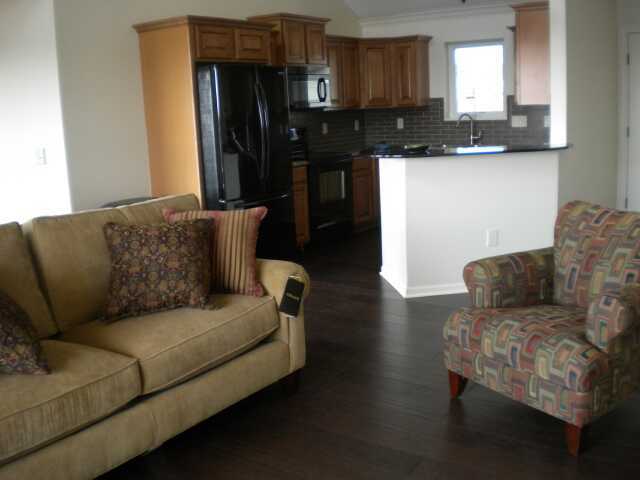 We are proud to report that on April 6th, 2010 this home was awarded Gold certification. 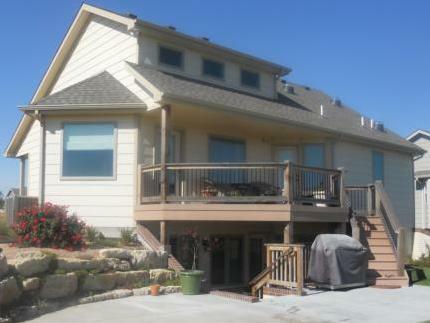 It is the first home to achieve LEED certification in Wichita, Kansas. ENERGY STAR® was developed in 1992 by the U.S. Department of Energy (DOE) and the U.S. Environmental Protection Agency (EPA). Its mission is to promote clean and efficient energy technologies, enabling consumers to save money while protecting the environment. 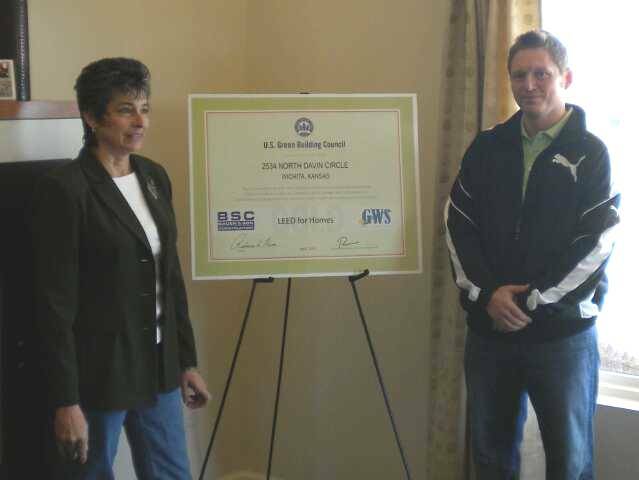 This home received the ENERGY STAR on April 8th, 2010.On Friday, April 9th, Teresa Burk, from the Wichita Committee of the USGBC Central Plains Chapter presented Adam Bauer with the LEED for Homes – Gold certificate. Teresa Burk and Adam Bauer. We want to acknowledge everyone that helped Bauer & Son Construction achieve these awards. The following are sub-contractors and suppliers participated in the construction of this home. Bell Mirror & Glass Inc.
We also want to acknowlege all the Bauer & Son Construction employees that participated in the construction including Drew Wyss – Project Supervisor, Michael Hansen, Ed Miller and Richard Ashford. Finally, we want to give special acknowlegment to Adam Bauer for his vision and determination to undertake this project, Greg Bauer for his support and expertise, Laura Heagler for her dilligence and persistance and Steve Houser for his expertise. Now that the testing and the final inspection are complete, furniture can be move in. Since the house will be used for promotion of “green building” by holding open houses and entering it in the Parade of Homes, it was decided that some furniture would help it “show” better. Couch and chair in the Living Room. 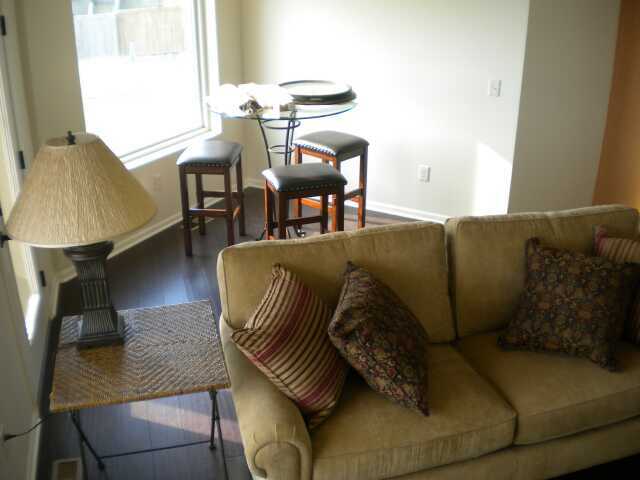 Glass table and bar stools in the Dining area. 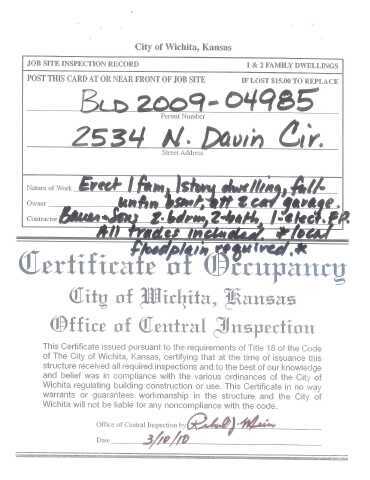 On March 10th the Bauer & Son Construction received a Certificate of Occupancy for the house. 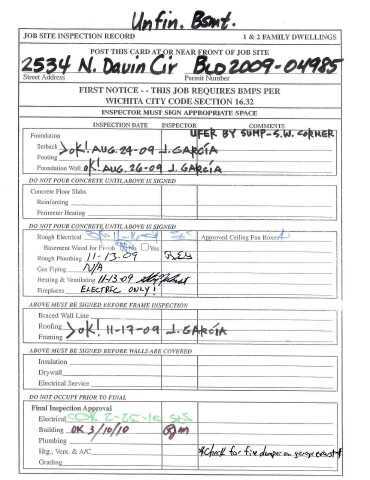 This completes the inspection process required by the City of Wichita. 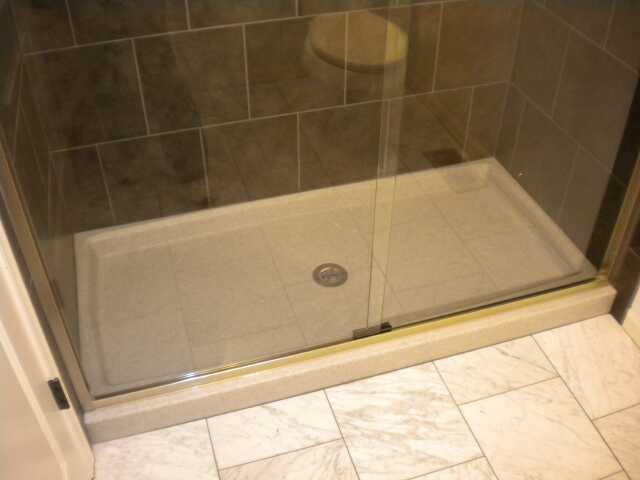 Glass bi-pass doors were selected for the Bath 2 shower. A decorative framed mirror was also selected by the owner to be hung above the pedestal lavatory. 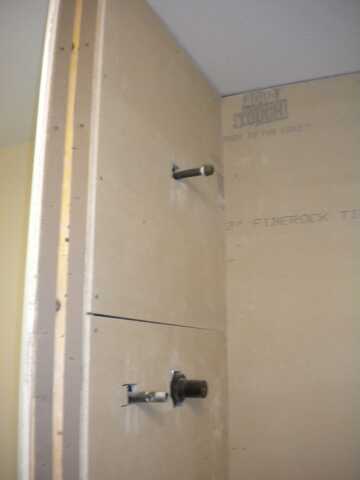 View of the top of the shower doors installed in Bath 2. View of the bottom of the shower doors installed in Bath 2. 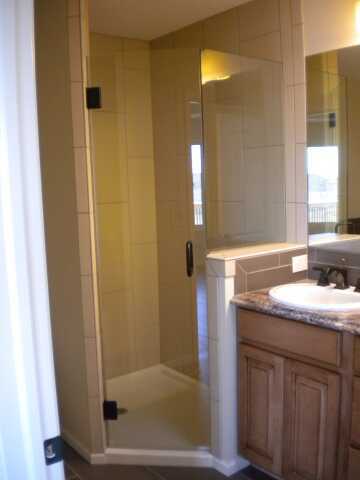 A frameless door and glass panel were selected for the Master Bath shower. 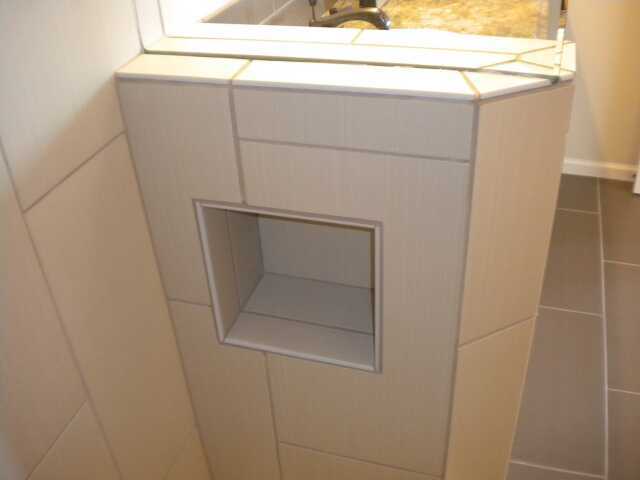 A plate glass mirror was selected to be installed above the vanity. The shower door and glass side panel installed at the Master Bath shower. 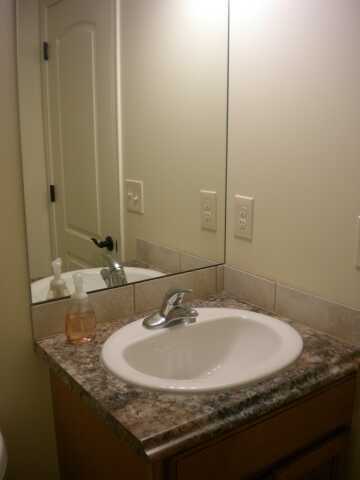 The mirror above the vanity is on the right side of the photo. The mirror above the vanity in the basement bath room. While energy modeling was performed as part of the design process for this house, verification of the actual tightness of the home is required as part of the perfornance testing for LEED® for Homes Energy and Atmosphere, AE category. 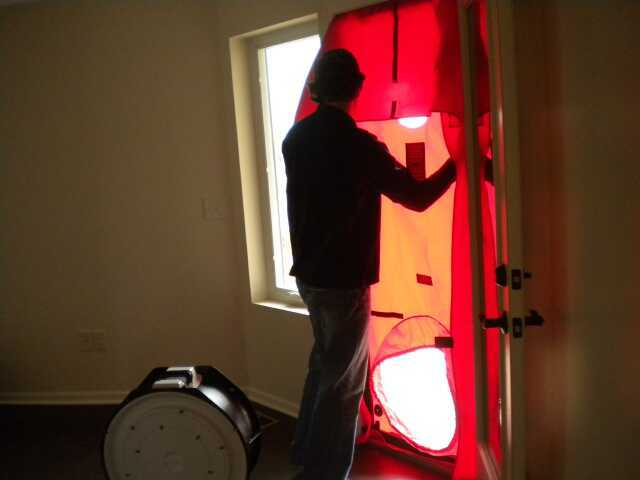 This test is performed by utilizing a diagnostic tool called a blower door which is designed to measure the airtightness of buildings and to help locate air leakage sites. 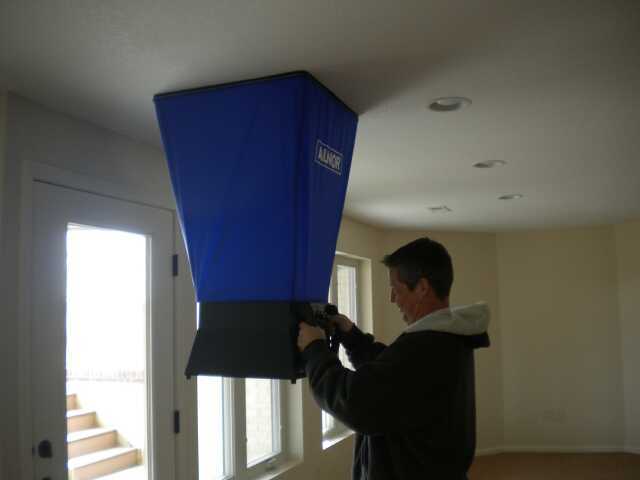 A blower door consists of a calibrated fan for measuring an airflow rate, and a pressure-sensing device to measure the air pressure created by the fan flow. 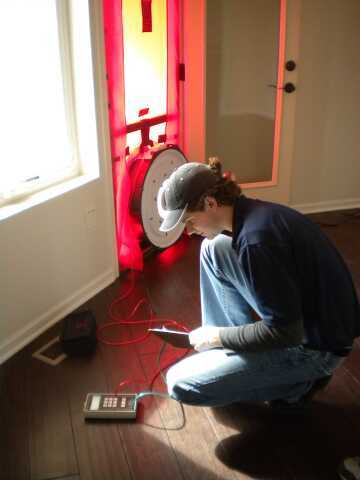 The combination of pressure and fan-flow measurements are used to determine the building airtightness. The blower door being installed in the Maseter Bedroom door to the deck. The fan is on the floor, behind the technican. The technican is recording readings from the pressure-sensing device connected to the blower door. The data from this test will be used to determine the final HERS rating the house will receive. Since we are not now going to qualify for Indoor airPLUS, we lost 13 points in the Indoor Environmental Quality category. In order to still be certified at the Gold level and achieve as many points as possible in this category, we now need to take the alternative Pathway 2 which is the Perscripitive Approach. This pathway includes 9 sub-categories that can be used to achieve points. Compliance with two of the sub-categories, EQ 5 Local Exhaust and EQ 6 Distrubution Systems will allow us to regain 3 points. This test pictured below is for EQ5 and is performed for all the exhaust fans in the house. An exhaust fan flow meter measures the cubic feet/minute (cfm) at that particular fan and that data is compared to the fan manufacturer’s rating. View of the test being performed in Bath 2. The test pictured below is for EQ6 and is performed for all the supply air duct openings in the house. This device, a balometer capture hood, measures the cubic feet/minute (cfm) at a particular opeining and that data is compared to the original design criteria. 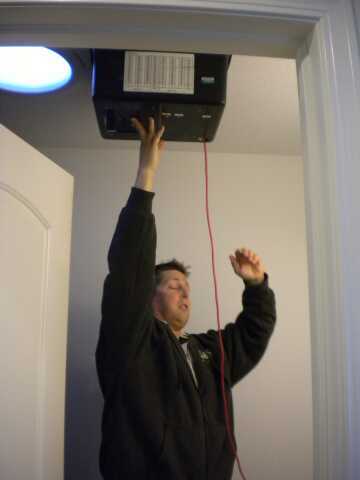 The hood being used on a supply duct opening in the basement Family Room. Water efficent toilets, faucets and shower heads qualify for points in LEED® for Homes and the NAHB Green Building Program. The toilets in all three bathrooms are rated at 1.28 gpf (galions per flush). The faucets in all three bathrooms are rated at 1.5 gpm (gallons per minute) and the shower heads are all rated at 1.7 gpm. The toilet and the lavatory installed in Bath 2. The toilets selected for all the bath rooms are Wellworth® by Kohler. The pedestal lavatory selected for Bath 2 is a Devonshire® by Kohler and the faucet is a Pepetua by Luxart. 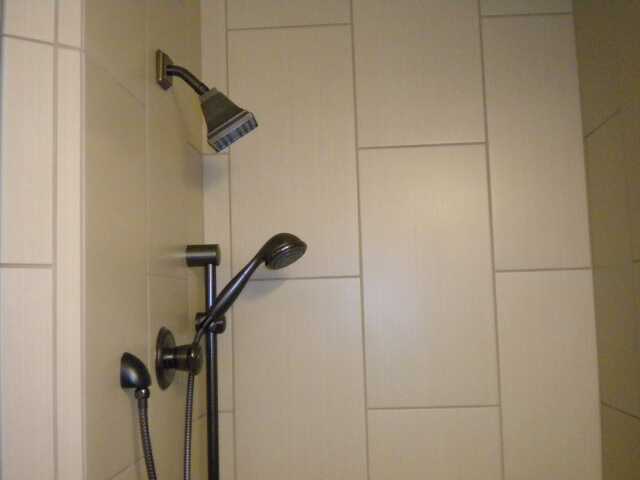 The shower valve and shower head installed in the Bath 2 shower. The shower valve and shower head selected are Perpetua by Luxart. 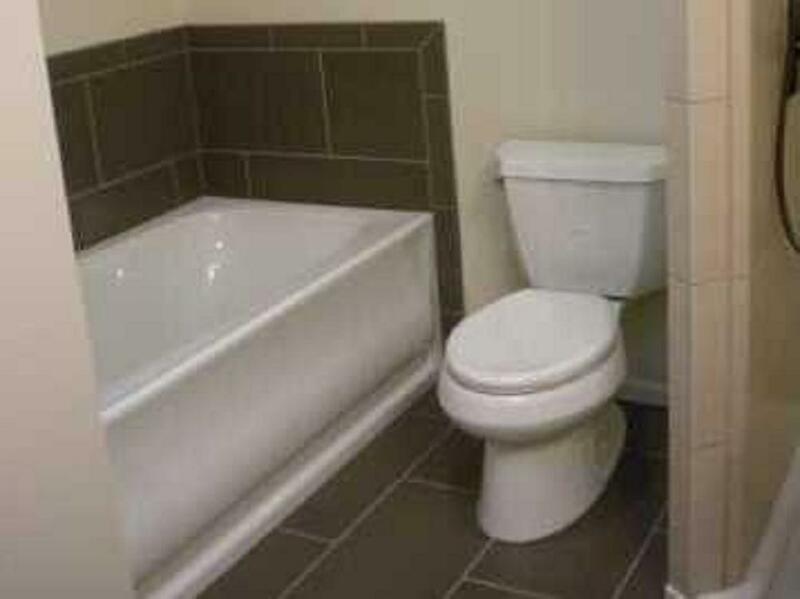 The toilet installed in the Master Bath. 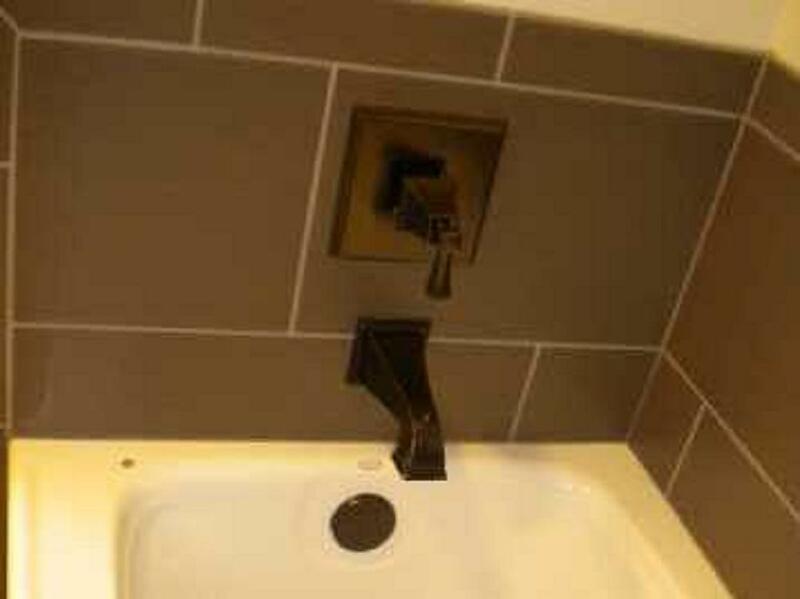 The bathtub valve and spout installed in the Master Bath. 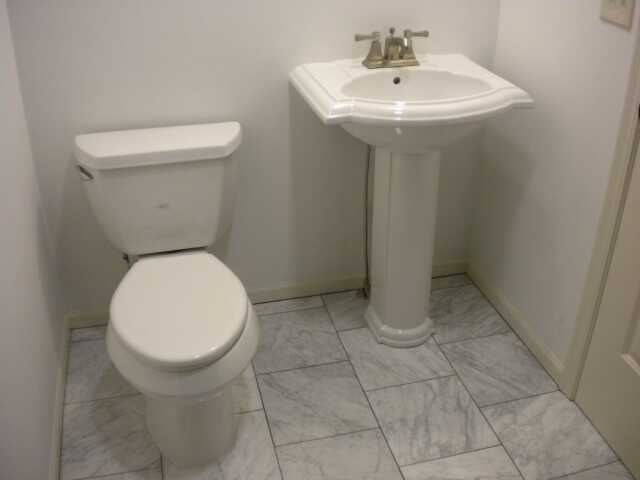 Faucets installed on the lavatories in the Master Bath. Shower valve and shower head installed in the Master Bath shower. The toilet and shower valve installed in the basement bath. 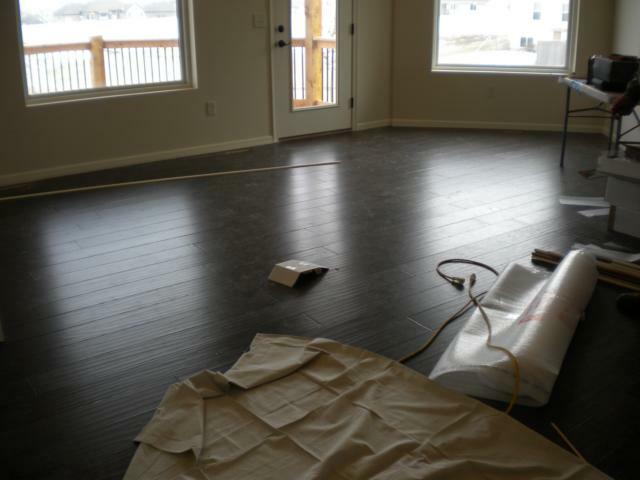 After the bamboo floor installation is complete, the installation of ceramic tile and carpet begin. 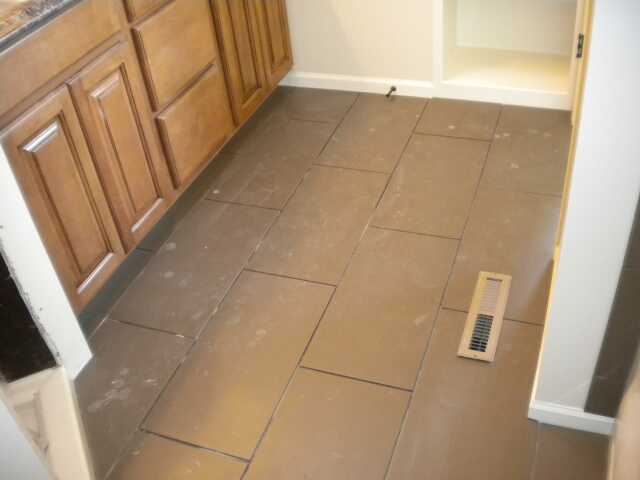 Since carpet was selected for the Family Room and the two bedrooms in the basement and will abut to the two area of ceramic tile, the tile work has to be completed first. As mentioned in our previous post titled “Bamboo Flooring” on March 17th, a prerequite for LEED® for Homes, Durability Management Process requires using a water-resistant flooring within 3’ of any entry door. 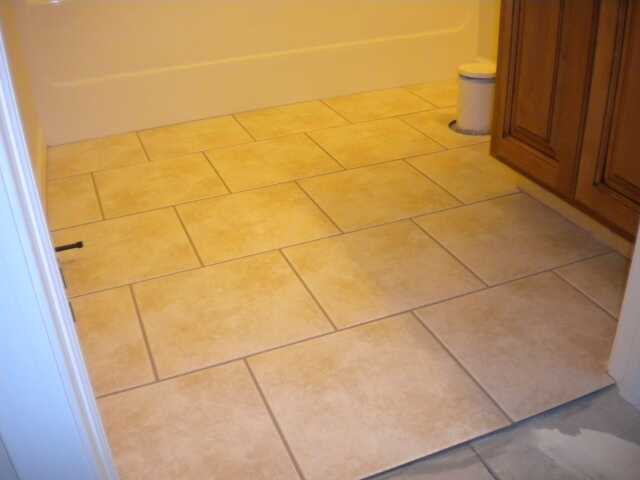 Ceramic tile was selected to meet this requirement at the exterior basement door. The tile selected for the door location is American Marazzi, Augustus 61, 12” x 12” ceramic tile. 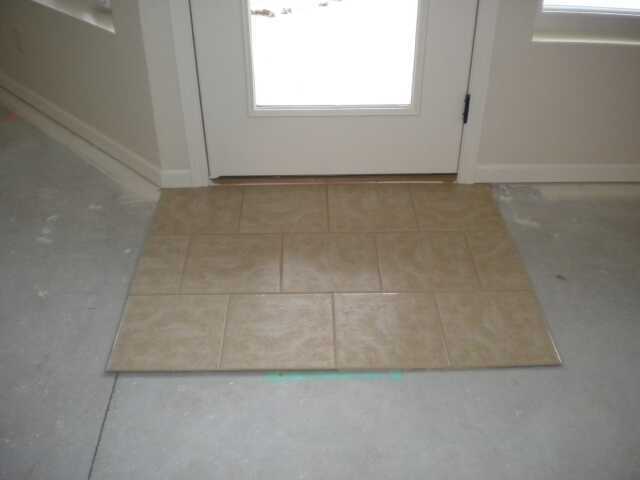 Ceramic tile installed at the exterior basement door. 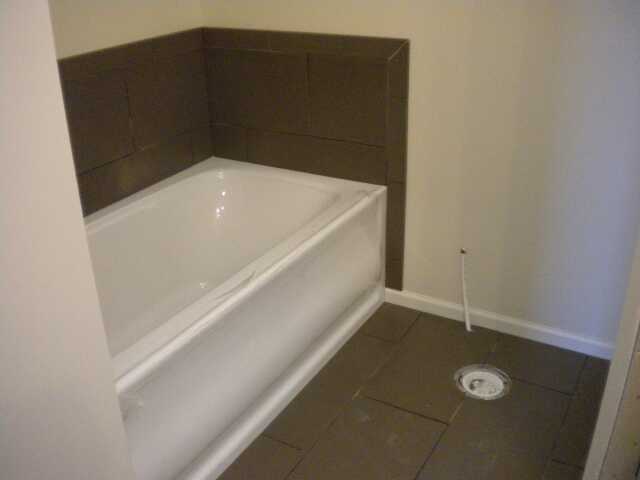 Ceramic tile was also selected for the floor in the basement bath. 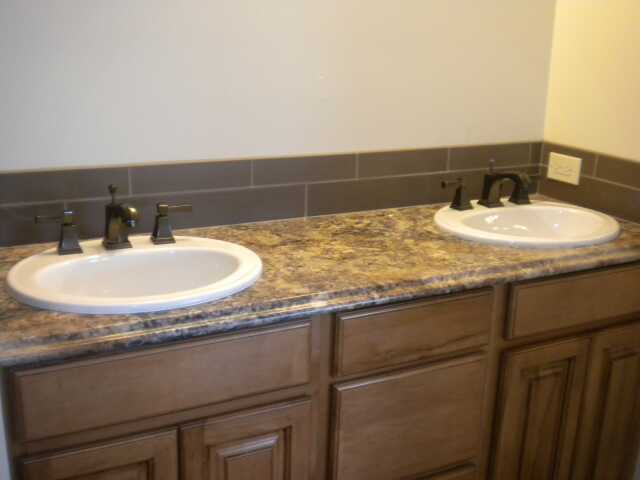 The tile selected for the bathroom is GBI Tile and Stone, Inc. Conti, 12” x 12” porcelain tile. 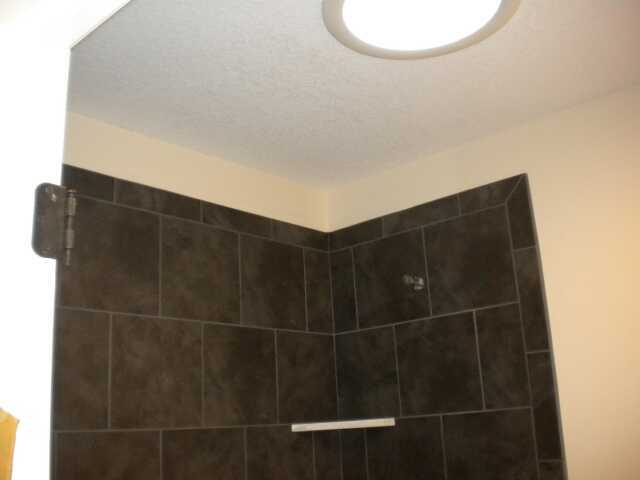 Ceramic tile installed in the basement bathroom. The owner also sellected the “brickwork” pattern fpr all the tile which offsets the joints from row to row. Now that the tile is complete in the basement, the carpet installation can begin. 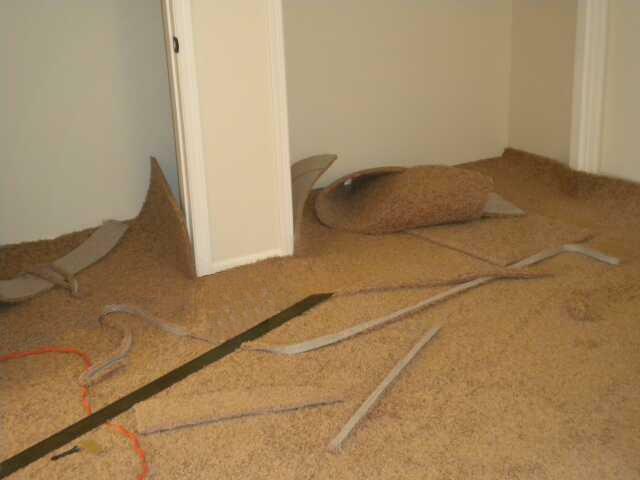 The first step in the carpet installation is the installation of the carpet tack strip. This wood stripping is so called because of the sharp nails that are exposed on the top side when is installed. These tacks that will hold the carpet when it is stretched. 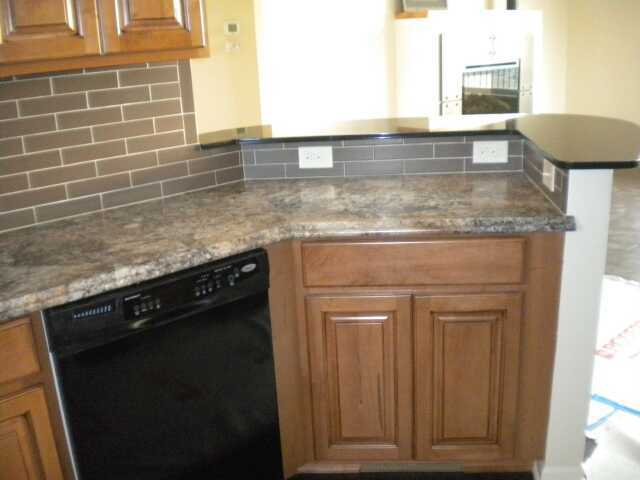 The tack strip used for this installation was manufactured in Wichita, by Baco Corp. 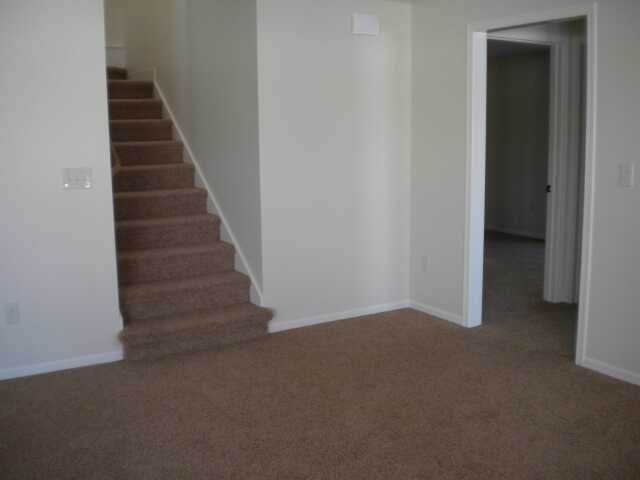 The carpet pad selected for the installation is 3/8”, 8 lb. Ultra Magic, made by Leggett & Platt from 100% recycled materials. Please visti www.lpurethane.com to learn more about this product. Tack strip and pad installed on the stairs. The carpet selected for the house is Great Scott II, manufactured by Shaw Industries and meets the Carpet and Rug Institute (CRI), Green Label Plus requirements. Please visit www.shawfloors.com/greenlabelplus to learn more about this product. Carpet being cut to fit in the West basement bedroom closets. 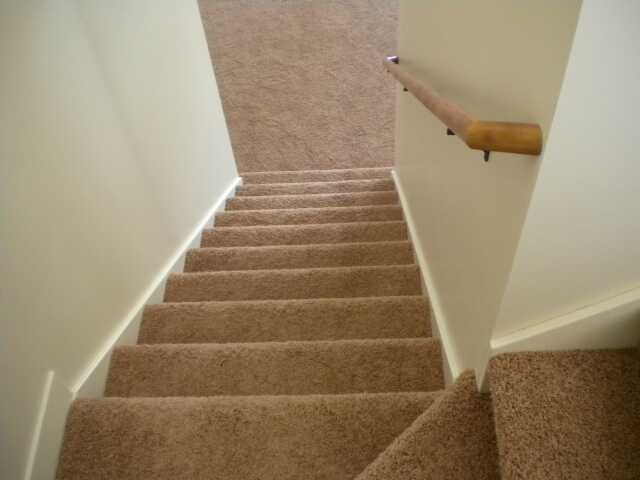 Most rooms are larger than the width of a roll of carpet so it is necessary to seam two pieces of carpet togeher. 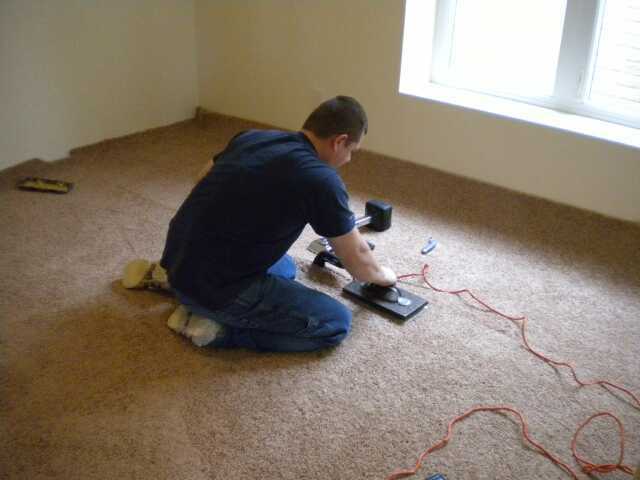 The carpet installer is seaming the carpet in the West basement bedroom. 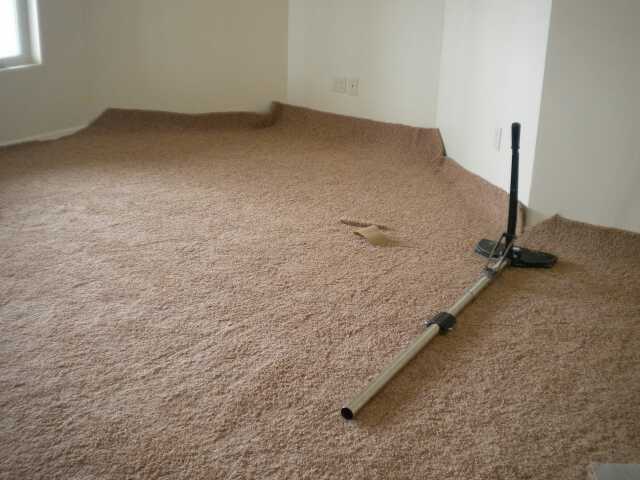 Carpet stretcher in the basement Family Room. 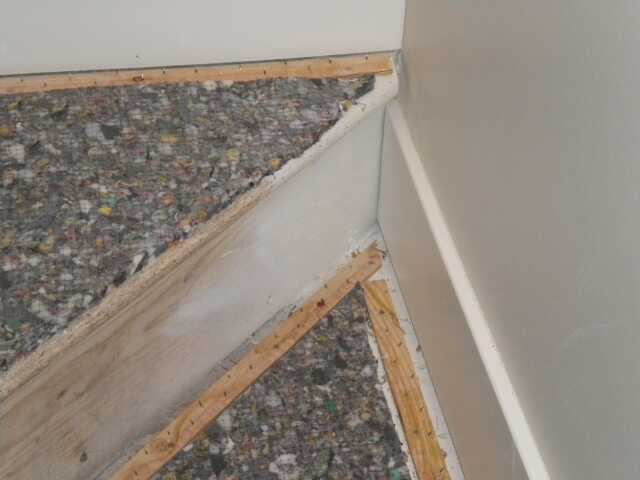 After the carpet is stretched and hooked on the tack strip it is cut around the edge. 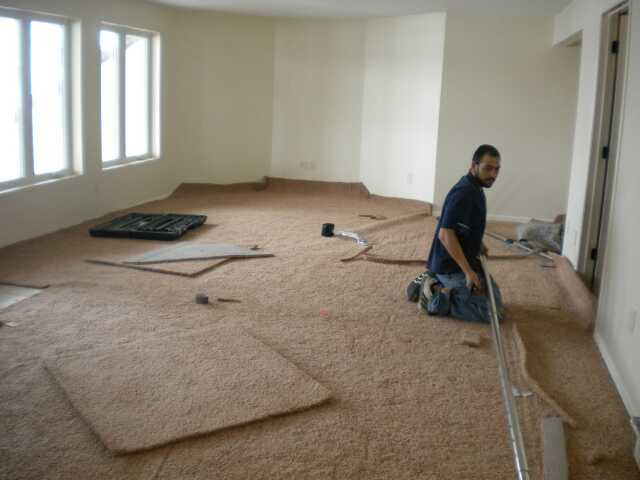 Carpet being cut to fit the basement Family Room. Carpet installation complete in the East basement bedroom. 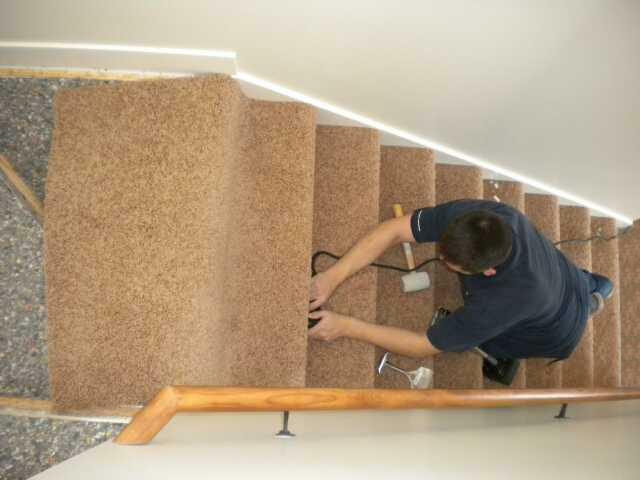 Carpet installation on the stairs. View from the Main Level looking down. 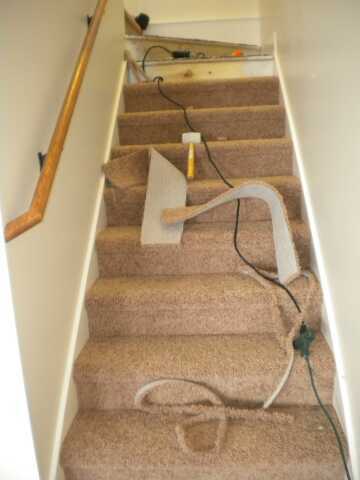 Carpet installation on the stairs. View from the basement. 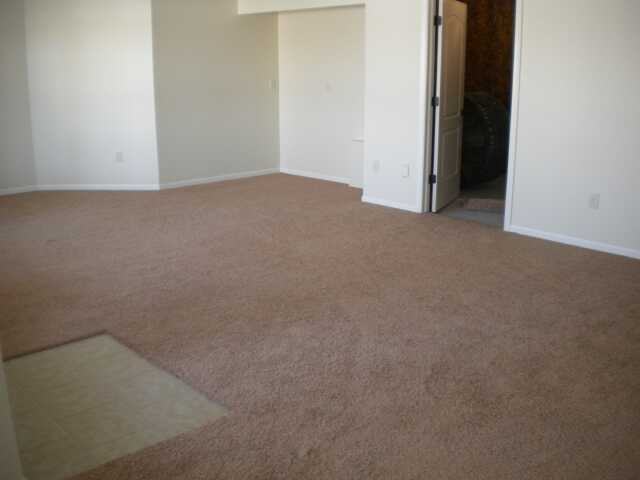 Completed carpet installation, Northwest corner of the Family Room. Completed carpet installation the basement Family Room with ceramic tile at the exterior door in the lower left hand corner. 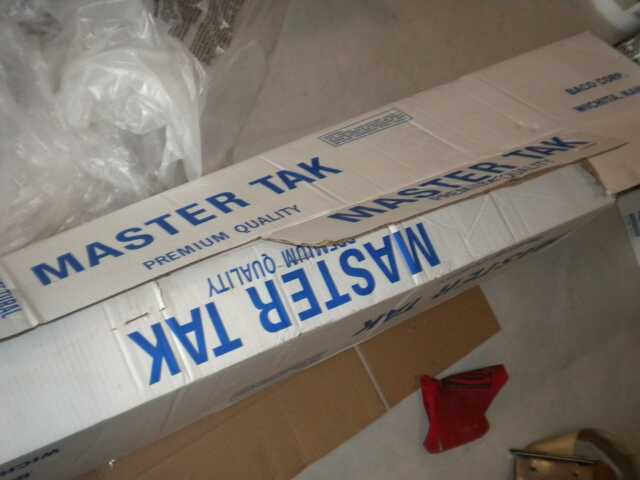 While the carpet is being installed in the basement, the preparation for ceramic tile begins in Bath 2 and the Master Bath. The owner selected pre-cast bases manufactured by The Onyx Collection in Belvue, Kansas, for both the showers in Bath 2 and in the Master Bath. These products are made from mixture of polyester resin and alumina trihydrate with a gelcoat on the surface. Please visit www.onyxcollection.com to learn more about this product. 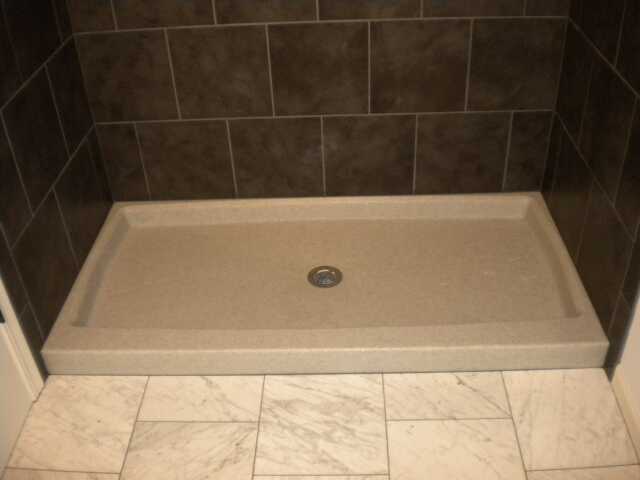 A atandard 60” x 30” pre-cast base is installed in Bath 2. 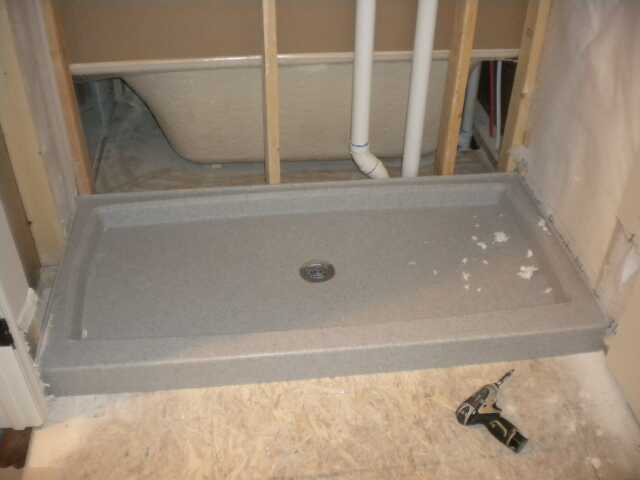 A custom size pre-cast base is installed the the Master Bath shower. 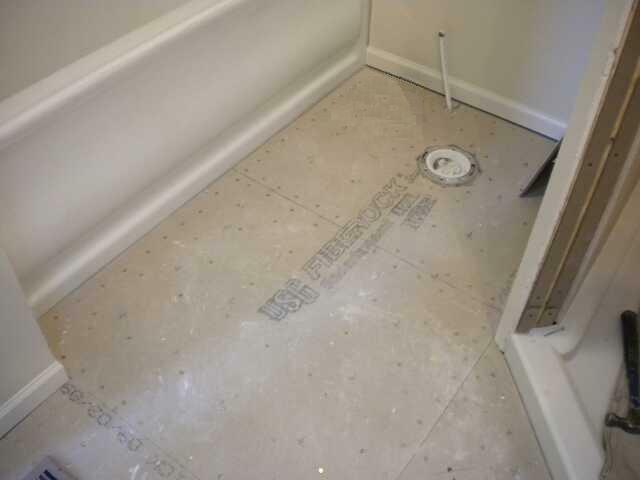 After the shower bases are installed, the walls and floors that are to be tiled are covered with USG FIBEROCK® Aqua-Tough tile backerboard. Made of a uniquely engineered gypsum/cellulose-fiber combination, it is strong, water resistant, and mold resistant, Please visit www.usg.com to learn more about this product. 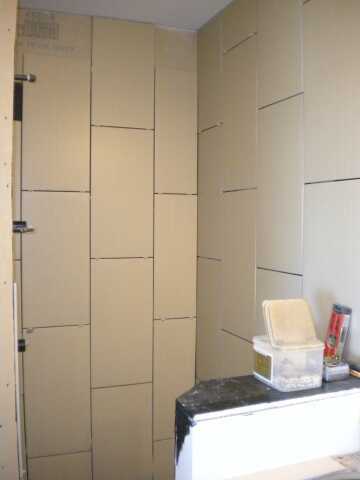 Backerboard installed on the shower wall in Bath 2. 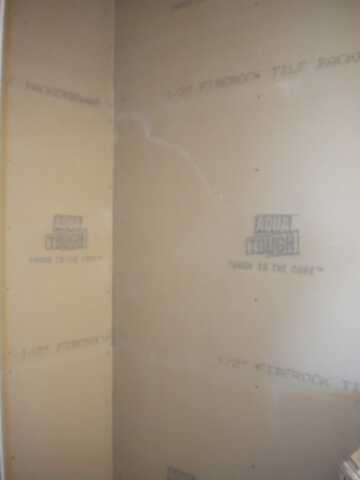 Backerboard installed on the shower wall in the Master Bath. 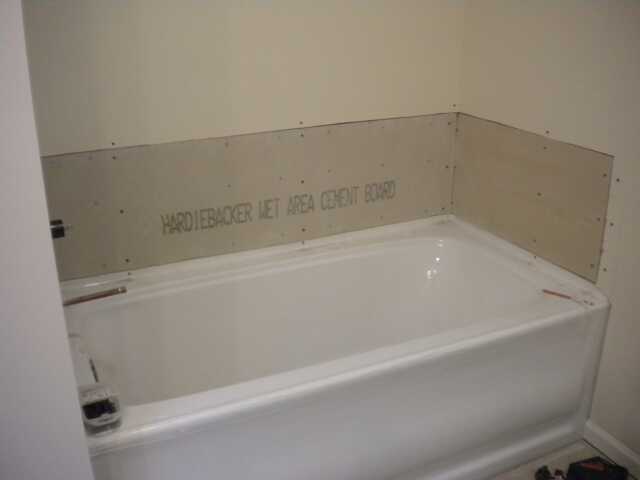 Backerboard installed on the wall around the tub in the Master Bath. Backerboard installed on the floor in the Master Bath. 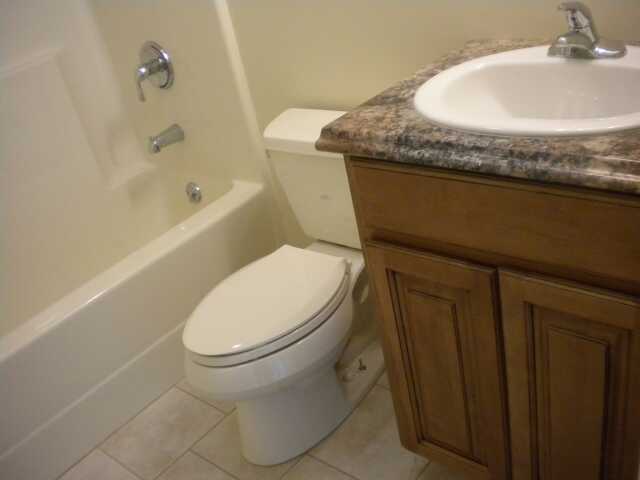 The tub is on the left and the shower is on the right. 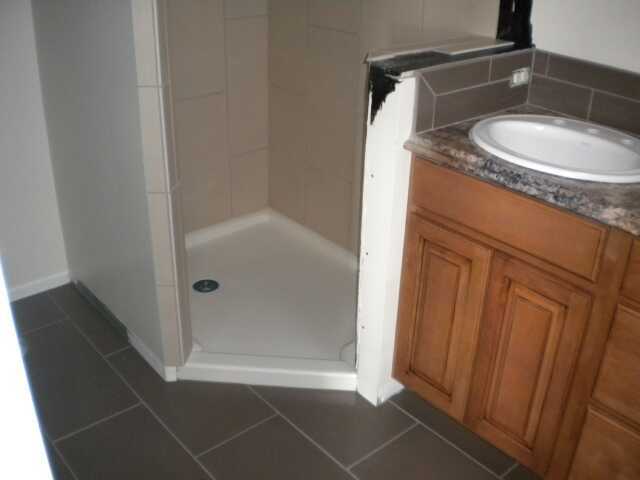 Tile installed in the shower and on the floor in Bath 2. 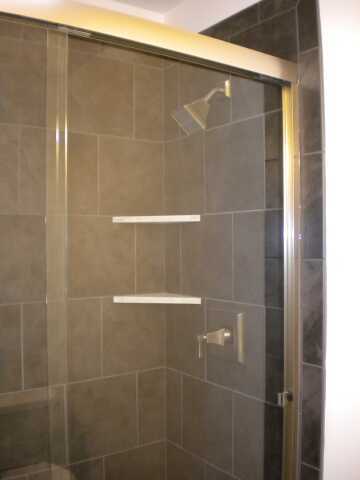 Shower with corner shelf in Bath 2. 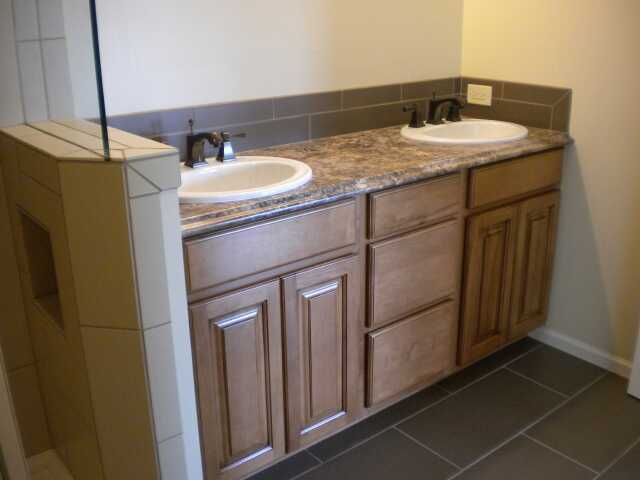 The tile selected for around the tub, the floor and vanity backsplash in is Neostile, Chocolate, 12” x 24” porcelain. 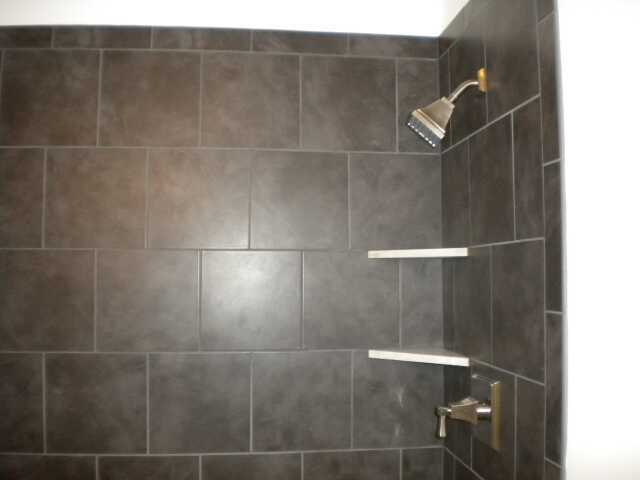 The tile selection for the shower is Neostile, Ekru, 12” x 24” porcelain. 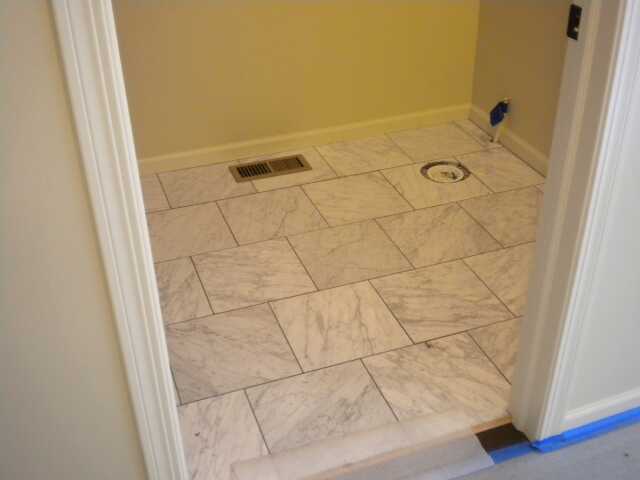 Tile around the tub and on the floor in the Master Bath. Master Bath floor looking toward the vanity, shower on the left and the tub on the right. Tile in the Master Bath shower. View of the pre cast shower pan in the Master Bath shower. Work in the shower is done until the glass enclosure and the door are installed. Recessed shelf in the Master Bath shower wall. Master Bath vanity tile backsplash. 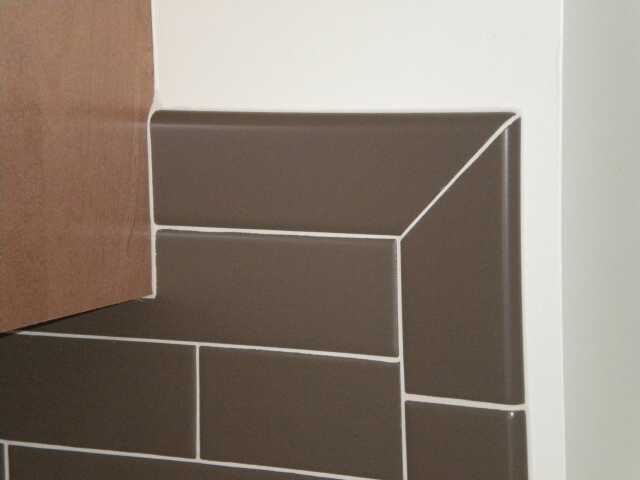 The owner’s tile selecton for the Kitchen backsplash is Dal-Tile, Modern Dimensions, Matte Cityline Kohl, 2” x 8” ceramic. 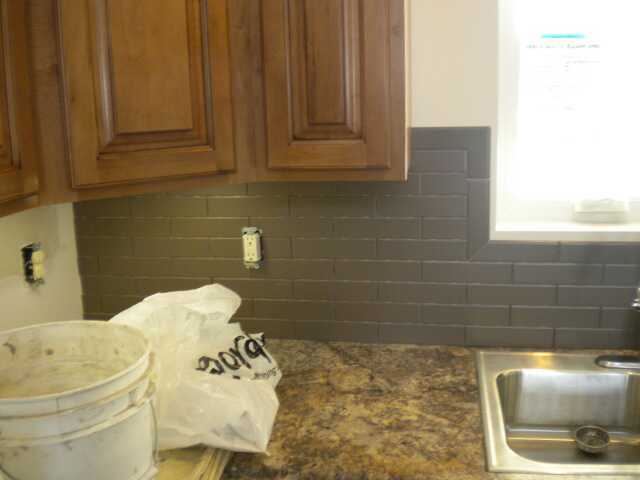 Tile backsplash on the West wall of the Kitchen. Tile backsplash on the North wall of the Kitchen and under the Breakfast Bar. Close up view of corner detail of tile around the Kitchen window.